Customer spend on data centre hardware and software has grown by 28 per cent during the past two years, driven by “burgeoning demand” for cloud services and increased prices for more fully featured servers. According to Synergy Research findings, the main beneficiaries have been vendors supplying public cloud infrastructure, who have seen a 54 per cent growth in revenues over the period. Growth for enterprise data centre infrastructure has been much lower and spending was actually in slow decline until the recent spike in server demand and pricing gave vendor revenues a boost. Within the enterprise it is private cloud infrastructure that is driving spending with a 45 per cent increase since the second quarter of 2016. In terms of market share, ODMs in aggregate account for the largest portion of the public cloud market, with Dell EMC being the leading individual vendor, followed by Cisco and Hewlett Packard Enterprise. 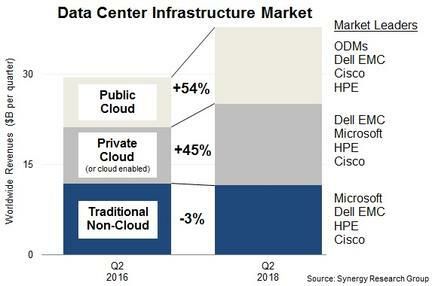 The Q2 market leader in private cloud was Dell EMC, followed by Microsoft and HPE - the same three vendors led in the non-cloud data centre market, though with a different ranking. “We are seeing cloud service revenues continuing to grow by 50 per cent per year,” said John Dinsdale, chief analyst at Synergy Research. “Also, we are seeing enterprise SaaS revenues growing by over 30 per cent, search/social networking revenues growing by over 25 per cent, and e-commerce revenues growing by over 40 per cent, all of which are driving big increases in spending on public cloud infrastructure. Meanwhile, total data centre infrastructure equipment revenues, including both cloud and non-cloud, hardware and software, were US$38 billion in the second quarter, with public cloud infrastructure accounting for a third of the total. Private cloud or cloud-enabled infrastructure accounted for over a third of the total. 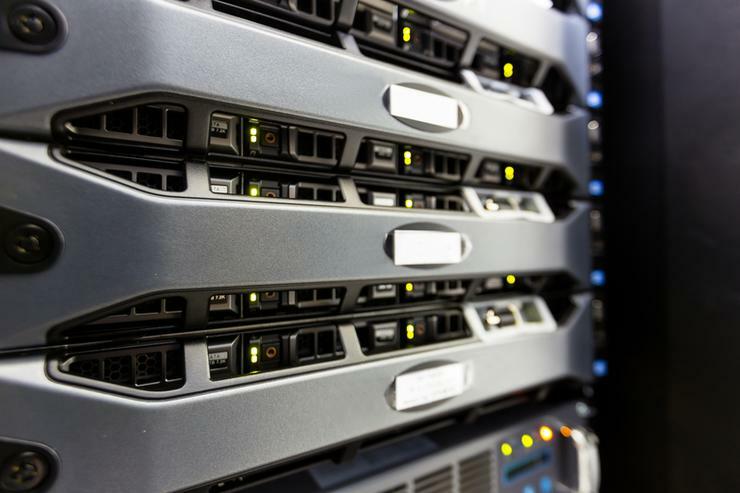 Servers, OS, storage, networking and virtualisation software combined accounted for 96 per cent of the Q2 data centre infrastructure market, with the balance comprising network security and management software. “By segment, Dell EMC is the leader in both server and storage revenues, while Cisco is dominant in the networking segment,” Dinsdale added. Outside of these three, Dinsdale said the other leading vendors in the market are HPE, IBM, VMware, Lenovo, Huawei, Inspur and NetApp.